Pancit palabok/pancit luglog and pancit canton are communal comfort food, and can be found at nearly all Filipino potluck parties. 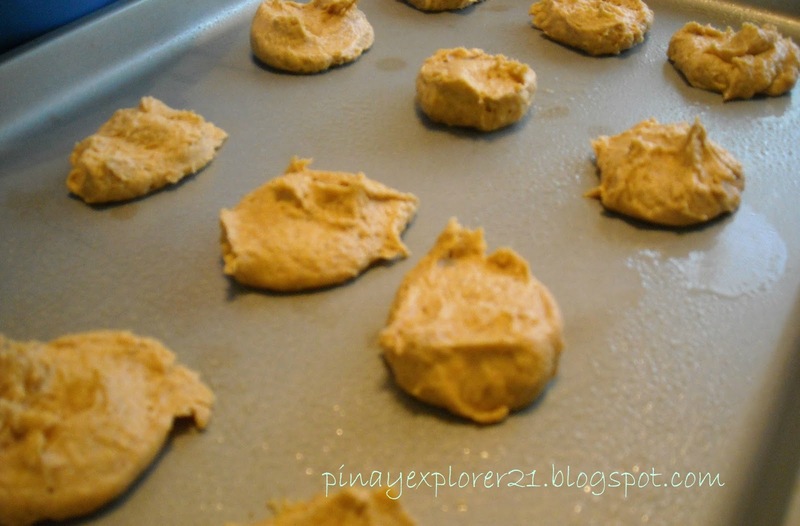 They are best made and eaten in batches for they are easily consumed. 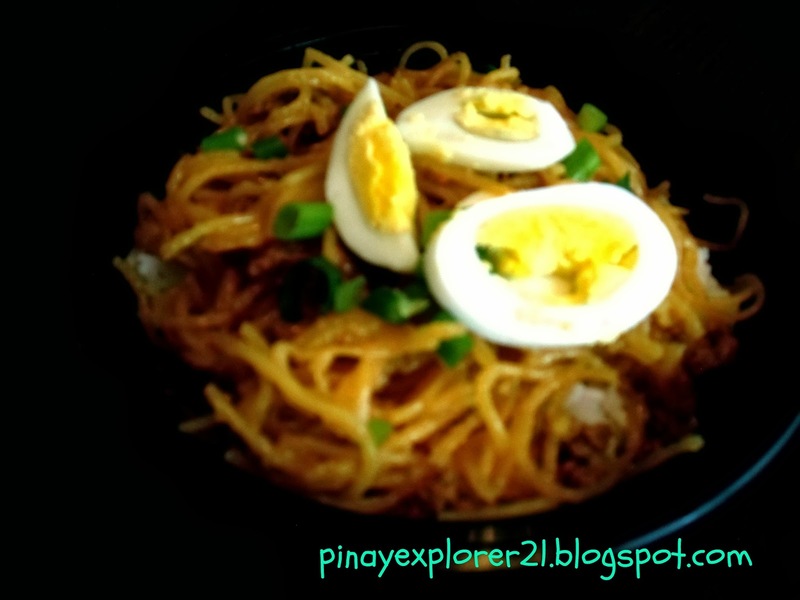 - I used the store bought shrimp sauce packet, but if you have a good sauce recipe for Pancit Palabok feel free to make it homemade. 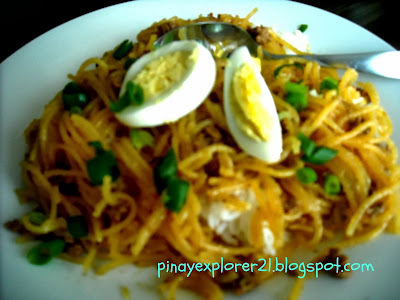 - Add your favorite garnish for Pancit Palabok. 1.) Put the ground pork on the skillet and let it brown. Add 2 cups of water bring it to boil. 2.) Add the store bought shrimp sauce or Pancit Palabok sauce. Simmer until it thicken the sauce. 3.) Set aside. Pour it over to the cooked rice noodles and add your favorite garnish. 1.) In large pot. Bring water to boil. 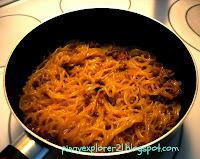 Add the bihon/ rice noodles let it cook for couple minutes. Drain; set aside. 3.) Serve with rice and top it off with variety of garnish. I like mine with boiled eggs and green onion. Below is my simplified Ice Pumpkin Cookie recipe. 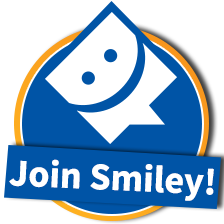 Check this out and let me know what you think. 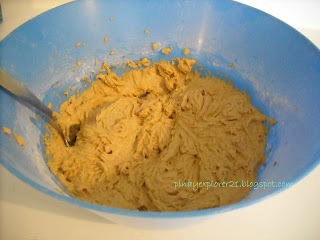 :) C'mon lets start baking! To Make Glaze: Combine 2 cups of confectioners' sugar, 3 tablespoon milk, 1 tablespoon melted butter, and 1 teaspoon vanilla. Add milk as needed, to achieve drizzling consistency. 2.) In a medium bowl cream the butter and sugar. Add the vanilla, pumpkin puree and egg, beat until creamy. 3.) Slowly add the dry ingredients onto the wet ingredients. Mix well. Put tablespoon of cookie batter onto sprayed cookie sheet, flatten slightly. 4.) Bake for 15 minutes. 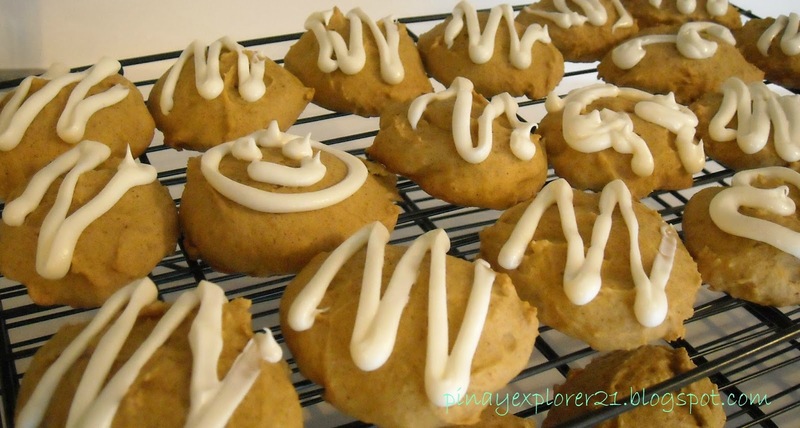 Let it cool and then iced the cookies. 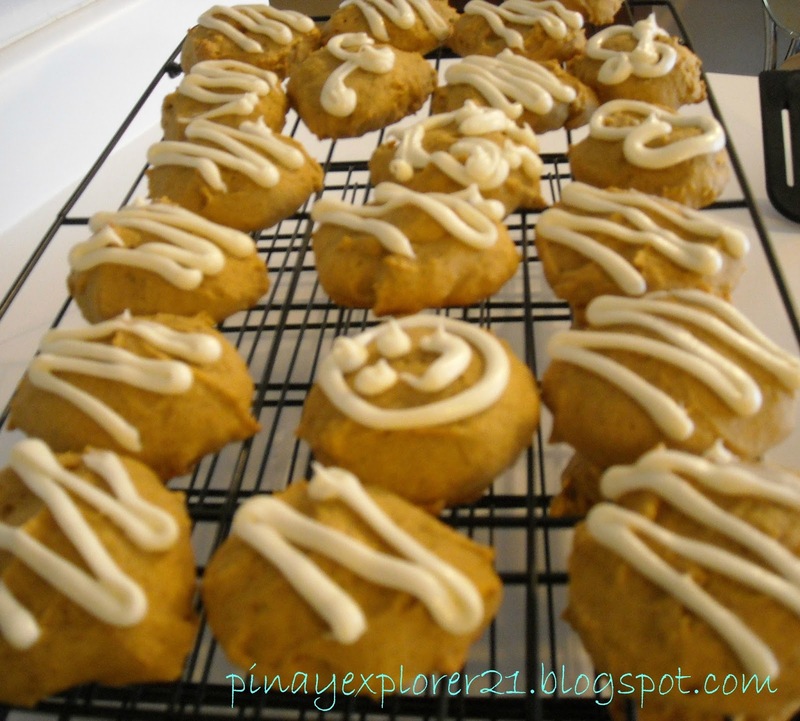 - I used the can pumpkin puree on this recipe, feel free to used homemade pumpkin puree if you have some. 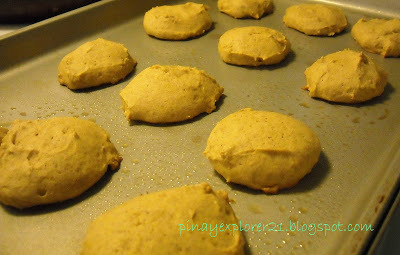 - cooking time varies depending on the oven your using, adjust the cooking time if needed. We are officially move in to our new place called- HOME! nothing feel sweeter than this..It does take a lot of work to moved luckily for us we got some help from family and friend that makes work easier and faster for us. It took me 3 days to settled down into our new place, putting all the stuff away and cleaning. We still have a lot of stuff to do but we have forever to do it, little bit a time. Moving forward! what you gonna say about KALE this week for dinner? Honestly, I haven't tried kale before, I just little intrigue about it when my co-worker talked about how she loved kale, the next thing I know, I found myself buying kale the next day...(hahah) that just typical me, I'd like to explore the flavor behind food. Thinking about adding some green onto our diet... So, here I am preparing Sauteed Kale with Sausage for dinner. It just happened that we have left over sausage from breakfast the other day but you can totally replaced the sausage with the meat of your choice or just leave it as simple as it is. 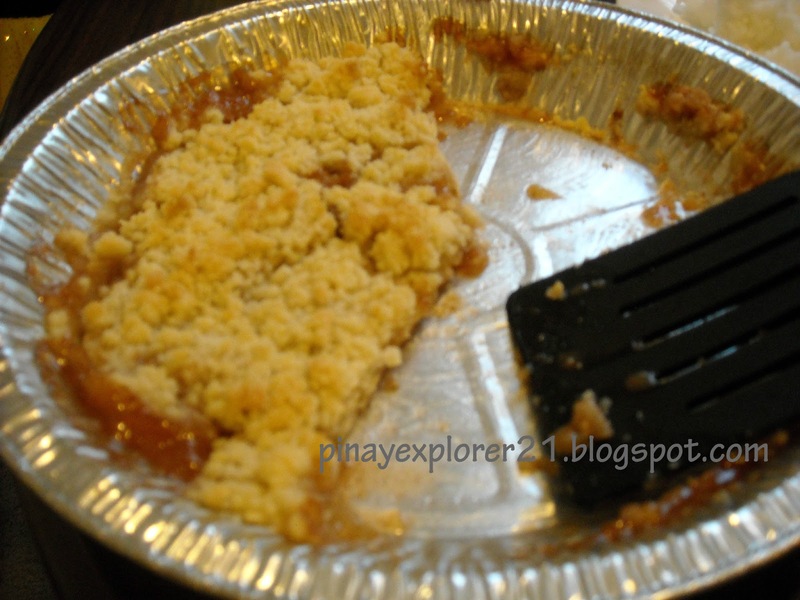 I wasn't sure if my kids gonna liked it, So, I was smiling looking at at their faces when they took the first bite.. 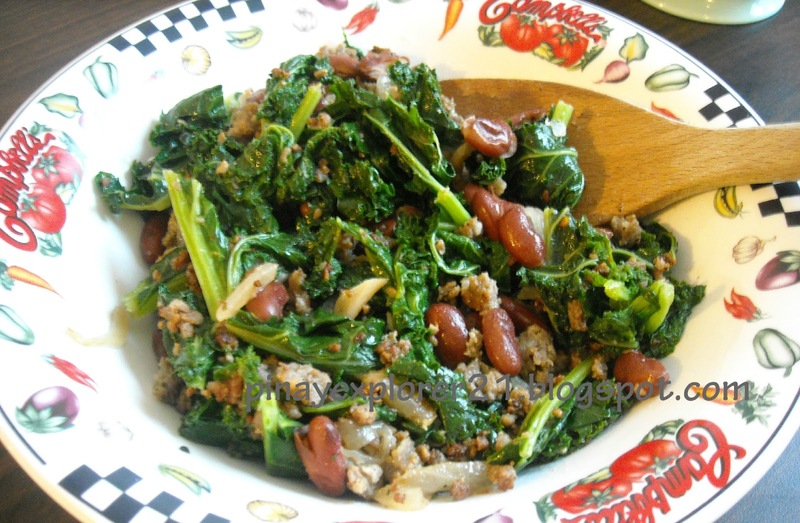 I surprised myself, they liked them..:) I also loved them too, I think it taste good..:) Try this Kale recipe on your next meal or vegetable stir fry. How to find fresh Kale and keep it fresh? 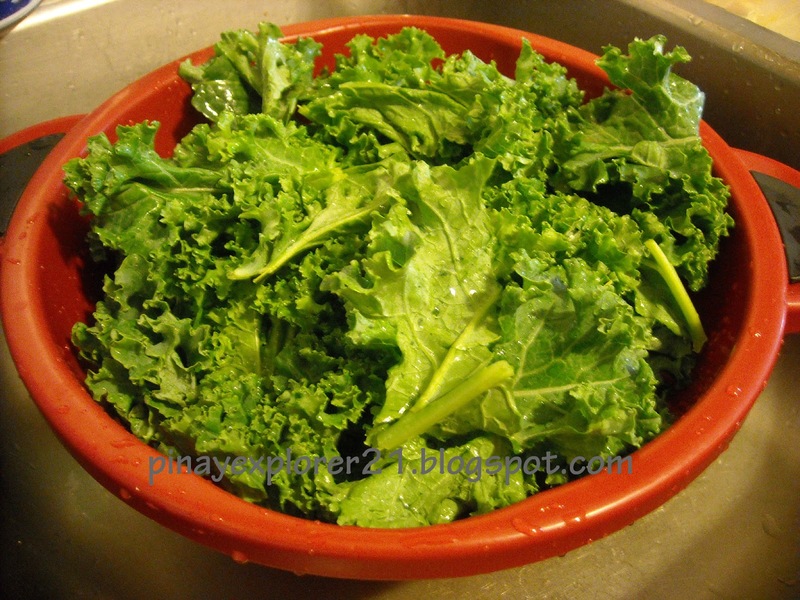 -To find the freshest kale, look for firm, deeply colored leaves with hardy stems. Smaller leaves will be more tender and milder in flavor. Leaves range from dark green to purple to deep red in color. 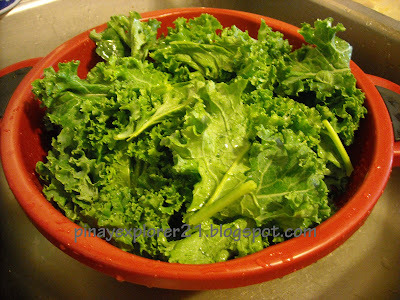 -Store kale, unwashed, in an air-tight zipped plastic bag for up to five days in the refrigerator. 1.) Put water in large pot, around 4-5 cups. 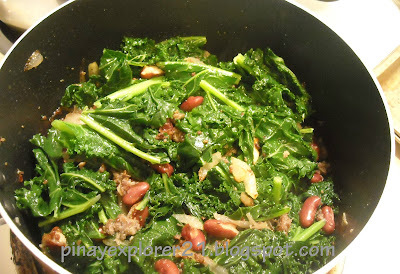 Let it boil; Meantime, Remove the tough center stalk of the kale then roughly chopped. Throw the chopped Kale onto the boiling water and let it boil for like 2 minute. Remove from the pot and drained. 2.) Meanwhile, put the oil and butter together in the skillet. Add the sausage let it cooked until golden brown. 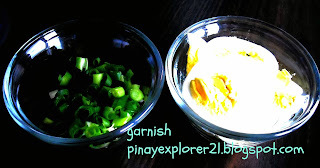 Add the onion and garlic sauteed until translucent. 3.) Add the Kale and beans; salt and pepper to taste. Let it simmer for 2-3 minutes. Add little water if it dry out. 4.) Remove from the heat. Best served when its hot. Enjoy! 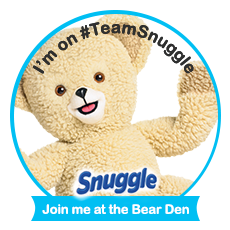 - Add your choice of meat and your favorite seasonings. - Beans is optional so you can totally replaced it with something you like. 1.) Combine 1/2 cup sugar, lemon juice, water and cinnamon in a bowl. 2.) 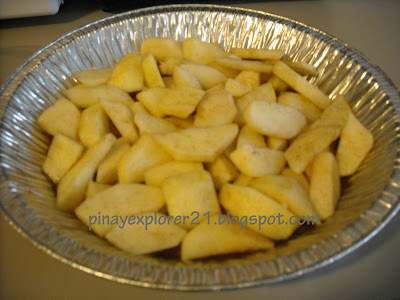 Add the peeled and sliced apple into the mixture. 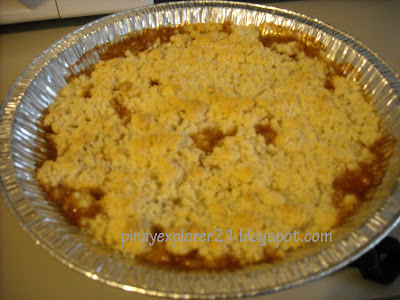 Mix well; transfer the mixture into baking dish- I used pie round 8x8 inches dish but you can totally used whatever you have on hand. 3. 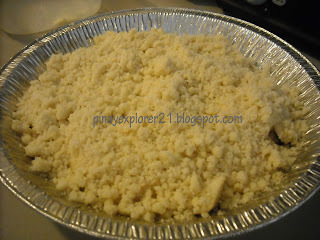 )Blend the remaining 1/2 cup sugar, flour, salt and butter until crumbly texture. Spread over the apples and pat smooth. 4.) Bake at preheated oven 375 degrees, 40-50 minutes or until apples are tender and crust is brown. -cut the apples the way you like it. - You can totally used the crisp recipe for other sweet good toppings. 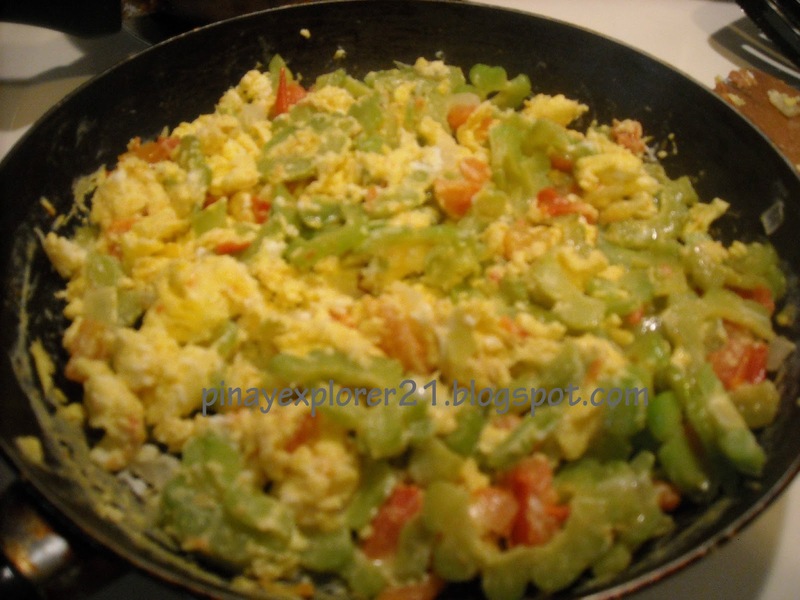 Below is my version of Bitter Melon sauteed with Eggs recipe, please feel free to do your own twist and style of cooking. Enjoy and have fun cooking!! 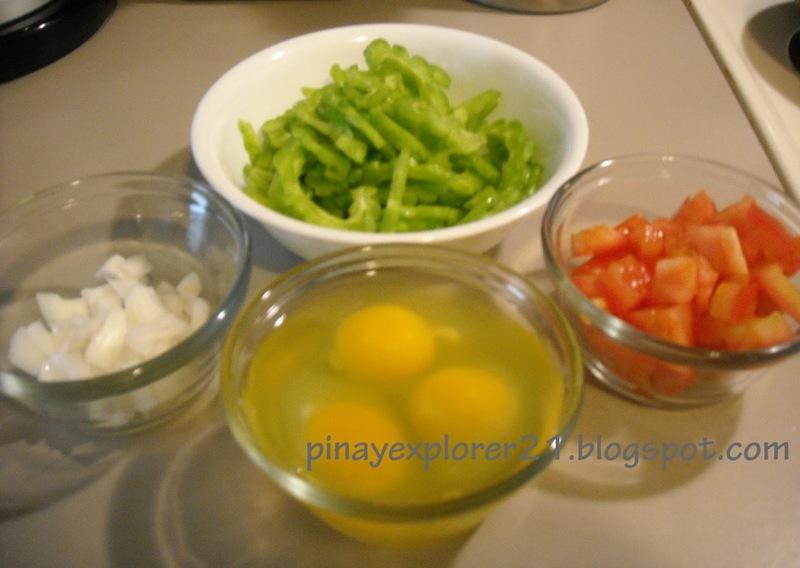 - Sliced the Ampalaya lengthwise, remove the seed by running the spoon inside the seed cavity. 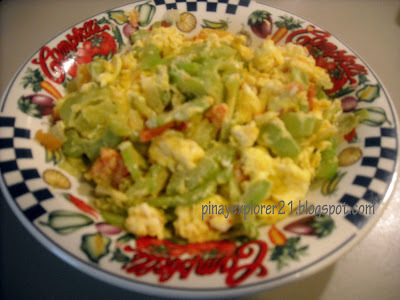 - Put the thinly sliced Ampalaya in a big bowl, sprinkle with some salt. 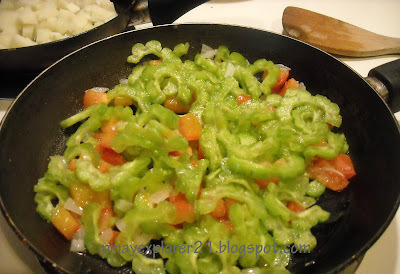 -Let it set for couple minutes, then squeezed the ampalaya until all the liquid comes out. 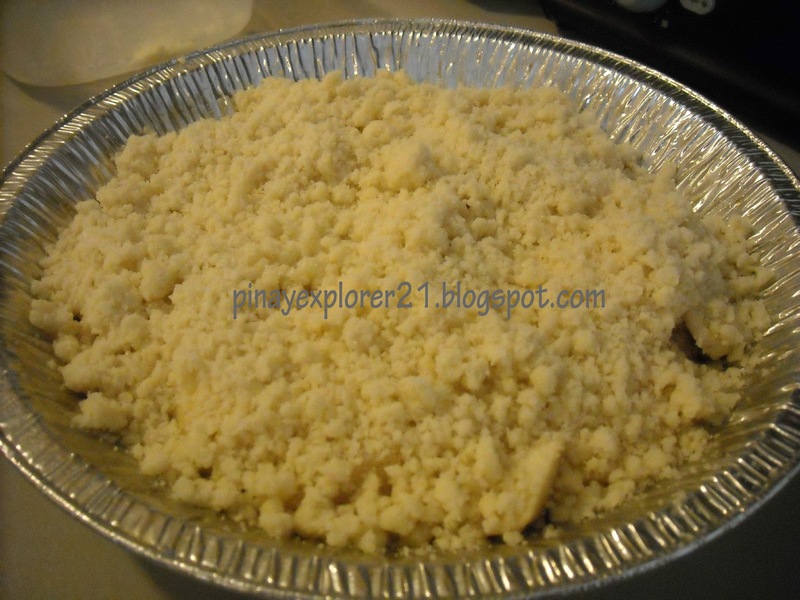 * My Mom practiced this method every time she made this dish; It works out great. Also don't over cooked the Ampalaya to avoid the super bitter taste. 2.) Add the slice bitter-melon ans let it cook for like 5-8 minutes. 3.) Add the beaten eggs into the skillet; Salt and pepper to taste. Let it set for 2 minutes or until the eggs is cooked. 4.) 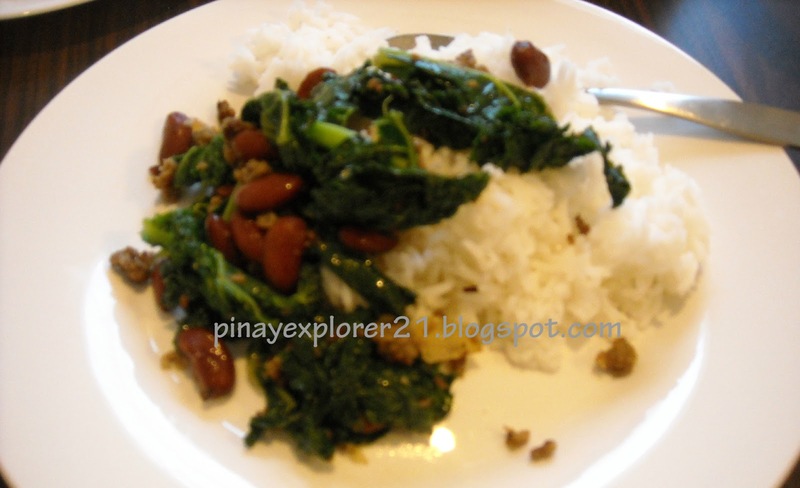 Best serve with hot rice. Enjoy! - Used whatever method you know to get rid of bitterness of Ampalaya. 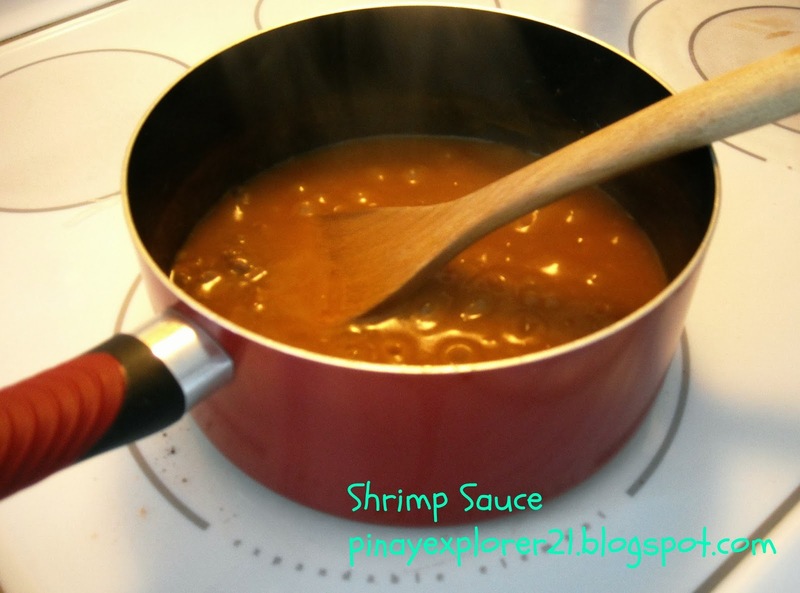 - Shrimp paste is great addition to this recipe, feel free to add some if you have it on hand.